This is the rare shortprint autograph, certified hologram'd and numbered out of only 200 in the world! 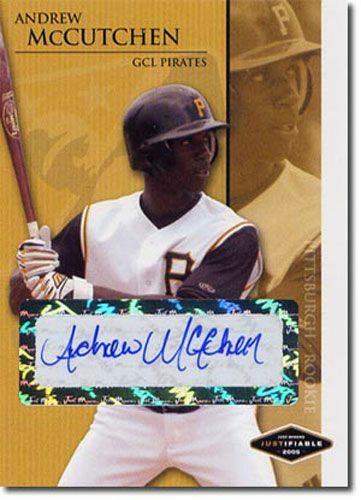 You are bidding on a 2005 ANDREW McCUTCHEN Just short-print, certified AUTOGRAPHED rookie card. We just pulled this rare insert! These cards were made when he was first drafted/signed and was sent to the minor league affiliate. Licensed and listed in Beckett, much rarer than most brands, and certified with the tamper-proof Just the Proof hologram - this is sure to be one of his more sought-after cards in the hobby. All of our cards are fresh from case breaks, Mint ready to grade. Once again, you are bidding on a 2005 ANDREW McCUTCHEN Just certified AUTO rookie card. He just doesn't have that much out there, and supply is really getting scarce these days - wait until the laws of supply and demand take effect. GET IT NOW WHILE YOU CAN! Also, be sure to check out our other items - we have TONS of rookie cards listed - base-cards, variations, autographs, limited edition, shortprint autos, rare 1/1's, and also bulk closeouts - and you can find it all listed in our store right now! 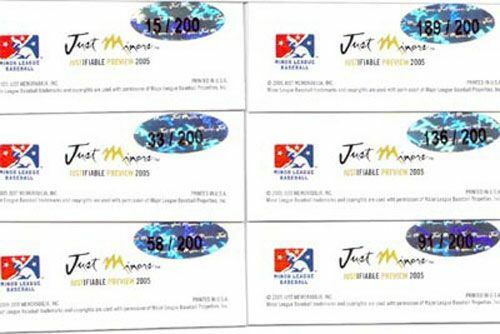 Please email with any questions before bidding. Thanks for looking and Good Luck!